Rent the Gallery & Hidden Art Courtyard at 177 King Street for your special event! 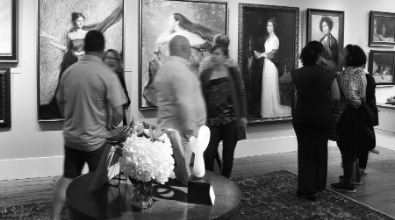 If you have a small gathering of friends and loved ones for your special even, surround your guests with beautiful artwork in Hagan Fine Art's gallery and courtyard. The patio at 177 King Street is a charming and intimate space, adjacent to Hagan Fine Art Gallery's interior. The gallery space is filled with beautiful original oil paintings and classically stylish decor. If the weather is good, a wedding on the patio is lovely. It's perfect for a small wedding or cocktail affair any time of the year. It's also a great place for a small corporate cocktail party or meeting. The Specifics: Capacity: 20 people maximum. There is room for a small one or two piece musical group. For your wedding, the space will accommodate a small wedding cake and champagne toast. We have two tables, one long rectangle and one round outside, for serving. Rental fee due at time of booking. We accept Visa, Master Card, American Express, Discover and checks.